Are you still searching online for an affordable, custom label that is made in America? 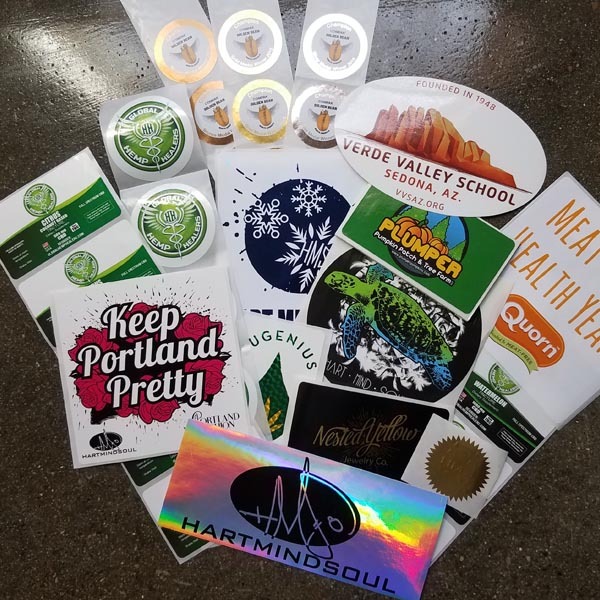 If you answered yes, than Hart Mind Soul is the best choice for custom stickers and label printing. You can save money with bulk orders and get free shipping with seasonal specials. Your sticker label needs vary from project to project, and we understand. You can buy affordably priced paper stickers with one or two spot colors printed if you want the lowest price. If you have a little bigger budget, consider upgrading to waterproof or foil labels and make a strong first impression. In addition to spot color and screen printed labels, we also offer CMYK and digital sticker printing services. If you have a sticker or label that needs to last for a long time, ask about our extended life and weatherproof vinyl options. Furthermore, you can even buy custom stickers and labels with scratch and sniff scents! Because scratch and sniff stickers need to be custom printed, the minimums can be fairly high and may require a custom quote. However, everyone who buys scratch and sniff labels from us always loves the quality. Additionally, Hart Mind Soul and the HMS nation offer custom die cut and specialty shapes. These are excellent labels for unique products that require something different than the standard square cut or circle sticker labels. You can request a free estimate for custom labels by clicking here and sending us the order specs. You can finally buy custom printed and embossed labels from an American company near you! In addition to having over 20 years of Five Star reviews, Hart Mind Soul also offers a 100% Customer Satisfaction Guarantee. Maybe that is why we are America’s Best Custom Label Company. Americas Best Custom labels, Best place to buy Custom Printed Labels, Buy American Made Custom Labels, Buy Custom Labels Near Me, Custom Labels For Sale. Bookmark.